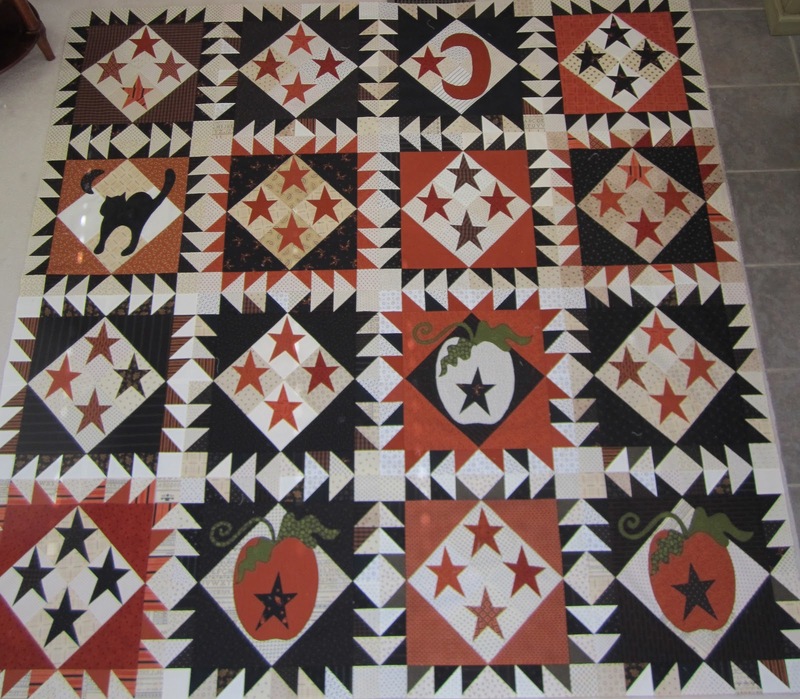 So I played around with that moon block, turned it left, turned it right, looked at the quilt on the pattern cover, looked at my picture of the Buggy Barn's finished 1904, and decided that the moon block didn't really bother me in those projects so it probably wouldn't bother me in my project once it was all done. I connected all the blocks and couldn't stop looking at that moon block! UGH!! I think the problem came down to the fact that the moon block was a primitive looking block, and just not my style. So another messy appliqué day later and this is what I came up with. I got the pattern here, from Stitchy Britches. I played around with the size some and made a few minor changes but basically that owl pattern came from that blog. The person who posted the pattern said it was free and that it was a late 60's crewelwork pattern. I have no idea if I'm breaking any sort of copyright laws by using that pattern, that's the problem with the internet. So the blocks are all back together and I like the looks of my owl, I don't think it's a distraction, just a nice addition. All that's left is to put on the outer border, which is pieced and ready to go. This was my 499th post, next up, my 500th! Sounds like something worth celebrating! Wow, the owl is a keeper! Great decision! omg the owl is adorable it is just PERFECT!!!! ok this quilt is still calling me!!!! The owl is a perfect solution. I just keep thinking that the moon is facing the wrong way in that block. If I buy this kit (I am holding back because I have SOOO many projects going) I will flip that block so the moon faces the other direction. On the other hand, I really like your owl. That owl is adorable, and makes the quilt very personalized, don't you think? Love the owl. I think it looks like it belongs there. Your quilt looks wonderful. You should have known better! LOL! I was so surprised that you had moved forward on the moon.. Then I saw that you didn't. You found a fantastic solution. The owl is definitely a keeper. I'm loving how this one is turning out. It is outstanding. I think I'm going to take mine to my annual retreat and make it then. What a great fall project to be working on now! Love the addition of the owl! Love the switch on the blocks. That moon just didn't do anything for the quilt. Can't wait to see it finished. I think that the addition of the owl is perfect - I didn't mind the moon - but the owl is so much better! The owl is such a great solution. 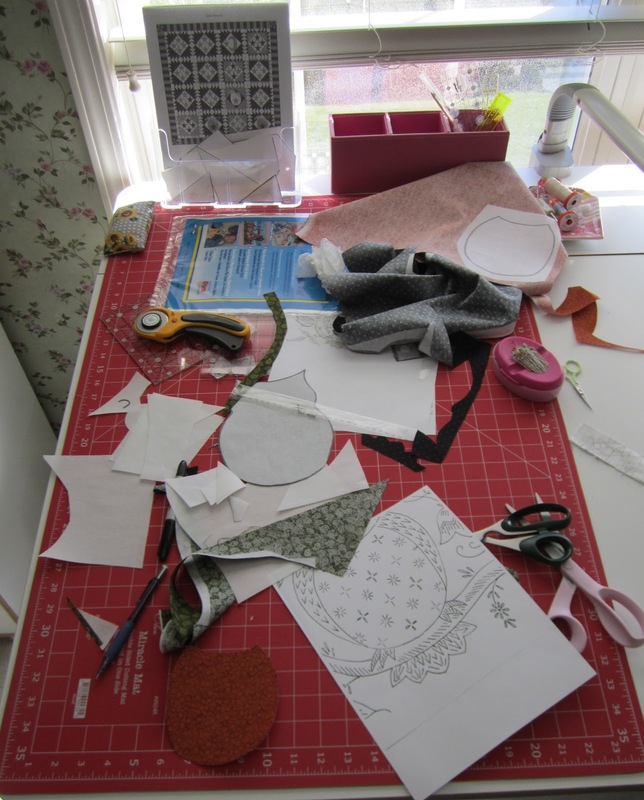 I am struggling with a block on a current project and think that perhaps I need to learn from your lesson and just scrap it! Love the owl addition. I like Diana's suggestion to use the moon in the backing. I like the moon, but it just seemed backwards to me - the owl looks much better. I really love this quilt. 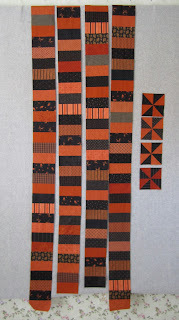 I'm off to the quilt shop today to replenish my orange stash! Your owl is fantastic...much better than the moon. I love the owl! What a perfect choice - much better than the moon. 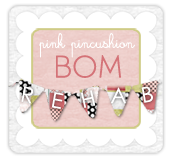 Make a throw pillow with your moon block! I agree that the owl is a nice addition, very harmonious with the other blocks. Great solution to the moon problem! That owl is perfect - what a great choice! The owl is so much better than the moon block it replaces and fits in nicely with the Halloween theme. I love the owl addition! How clever! Your owl is adorable~! The moon doesn't look like any moon I've ever seen so good call. I didn't mind the moon block but the owl is perfect. Great choice! I didn't mind the moon...but I LOVE that owl! Great job making it all work! Love the owl! I'm so glad I'm watching you and Nicole do the project, so I have all these great ideas to sort through when I do mine! I liked the moon...but I LOVE the owl!!! fabulous quilt! I withheld a comment about the moon as I figured it's 'your' quilt, but I do like the owl SOOOOO much better. You go, girl!!! It's a totally cute quilt!! LOVE THAT ADORABLE OWL !!! PERFECT!! The moon block was fine, but this owl is so much better! It is the perfect addition. I like what a couple of others said - put it on the back of the quilt along with your label/pieced backing! I love your owl! He fits in just perfect with the rest of the quilt. This is going to be an awesome quilt. I love the owl. Looking at the pattern the moon bothered me too. I resolved that if I did it, I'd add another cat or make a different moon. I love the owl idea! Perfect way to make it your own! Liked the moon... LOVE the owl! 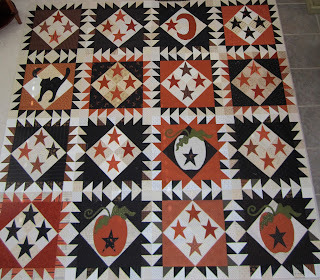 Wonderful Halloween 1904 quilt... so neat that you added your own special touches. The owl couldn't be more perfect. It has just the right sizzle for your quilt. One reason I didn't like the moon was I kept wanting to correct the "C" to be facing the right way. That moon always bothered me in that pattern. I love the owl-what a great solution! Love, love, love that owl block! Way too cute, but not too cute :) Love how you and Nicole have personalized this pattern! Really like the owl...I would never have thought of that! You are so creative. I have the pattern but haven't started my quilt. It has been fun to see what you and Nicole have done.....working the bugs out for us! Love your quilt. I like the owl much better than the moon. and I get to make the 50th comment! I absolutely love your new block! I love the entire quilt! It has been so much fun seeing it come together. Love the quilt and the owl. Didn't like the moon it looked like a weird C. Enjoy your blog! Very creative, Thelma!! I like your owl, too. 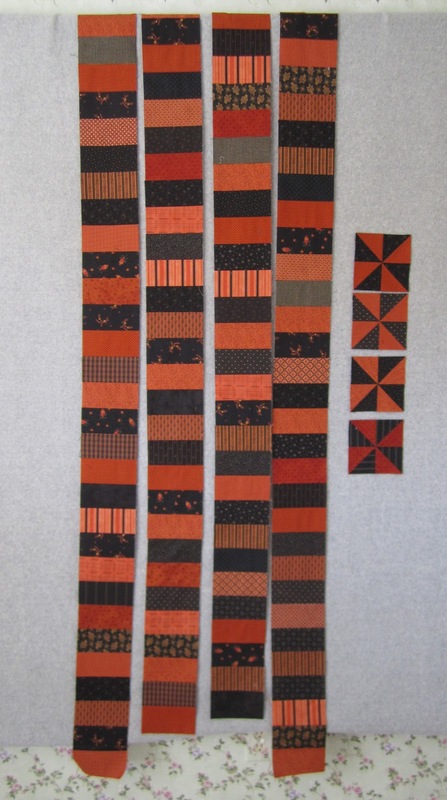 I'm amazed at how much quilting you accomplish. 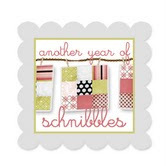 Your blog is an inspiration--now I'm "hooked" on Schnibbles. The owl is perfect! I wasn't a fan of the moon either, great choice to change it! I'm glad you decided against that moon. The owl is much better and gets my hoot of approval. I am over the moon for the owl................... really over!!! I mentioned re-drawing the moon, but I'm sure liking that little guy - it's like a "who done it"? Yay, you for making it yours! It's waaay cute! !